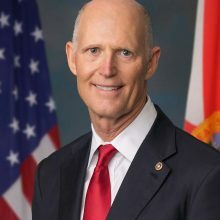 Rick Scott was elected to the U.S. Senate in 2018 and is currently serving his first term representing the state of Florida. Prior to his election to the U.S. Senate, Rick Scott served two terms as the 45th Governor of Florida, working every day to turn around Florida’s economy and secure the state’s future as the best place for families and businesses to succeed. Scott grew up in public housing in the Midwest as his adoptive father, a World War II veteran and truck driver, and his mother, a store clerk, struggled to financially support their family. After marrying his high school sweetheart, Ann, Scott joined the Navy, where he served active duty as a radar man aboard the USS Glover. He used the G.I. Bill to attend the University of Missouri, Kansas City, and eventually opened his first business – a donut shop. Scott went on to run the world’s largest healthcare company and continues to fight every day so families across the state can have the same opportunities he had to live the American dream. Rick Scott knows firsthand that a good paying job is one of the most important things for a family, and following Florida’s economic collapse ten years ago, he made the decision to run for governor as a businessman with no political experience. During his term as Governor, he successfully championed more than $10 billion in tax cuts and cut thousands of burdensome regulations that led Florida businesses to create nearly 1.7 million new jobs. Under his leadership, the unemployment rate dropped from 11 percent to 3.3 percent, Florida paid down $10 billion in state debt, and record investments were made in what matters most to Floridians – education, the environment, and public safety. Rick Scott and his wife, Ann, have been married for 46 years and have two daughters, Allison and Jordan, and six grandsons, Auguste, Quinton, Sebastian, Eli, Louie and Jude.